Graeme Joffe's voice has been heard over the South African airwaves for the past decade, having been sports presenter on 94.7 Highveld Stereo's breakfast show The Rude Awakening and Breakfast Xpress for 8 years, before moving on to Radio Today, where he presents Sportsfire. 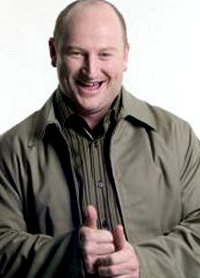 Graeme Joffe is affectionately known as the "Master of the Stupid Sports Joke”, and has been involved in countless hilarious on-air pranks with co-Highveld Stereo presenters Jeremy Mansfield and Darren "Wackhead" Simpson. Graeme Joffe has been involved in the media for many years. After finishing a degree in journalism at Rhodes University, he worked as a World Sport Presenter for CNN in Atlanta from 1992 – 1999, after which he presented for Supersport for 2 years. As an MC, Graeme Joffe shares some highlights from his time spent with CNN, as well as memorable athlete stories and annecdotes from behind the scenes of the Olympics and other major sporting events. He includes current sport news, sporting trivia and jokes in a light hearted presentation which has made him a favourite for sports events, award evenings and corporate functions. If you looking for more Corporate Entertainment - We can provide YOU with South Africa`s TOP Artists. Hire a Comedian, Master of Ceremonies, Live Bands, Dance Acts, you can even Hire a Magician - We have the very BEST in Live Entertainment for your function or event.